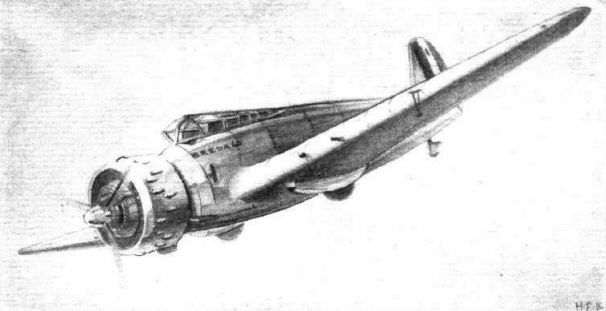 The Fokker D.XXI fighter seen in this Flight sketch has a radial engine, but the liquid-cooled type, such as the 860 h.p. Hispano Suiza Ycrs canon engine may be fitted. With that power plant a speed of 273 m.p.h. is attained. SLEEPER TRANSPORT: The new Douglas D.S.T., which will carry sixteen passengers as a "sleeper transport" and twenty-four in the ordinary way, on test at Santa Monica, California. With two 930 h.p. engines - presumably the latest Wright Cyclones - the D.S.T. has a maximum speed of approximately 215 m.p.h. OUTSTANDING MILITARY TYPE. 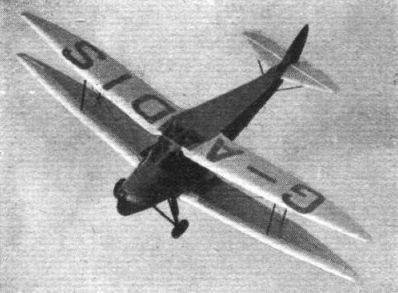 The fastest produced during the year was the Hawker monoplane, which, fitted with a Rolls-Royce Merlin engine, is now being tested. The long "conservatory" is the most striking feature of the machine. 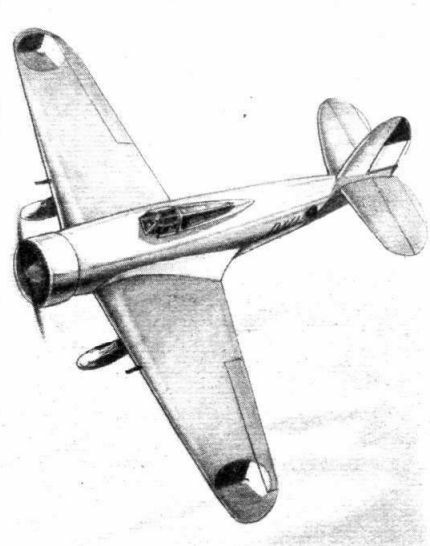 A Wright Cyclone of 750 h.p. is fitted to the new Vultee V-11 attack bomber. In this view the cowling has been removed and the exhaust system and several other items are visible. 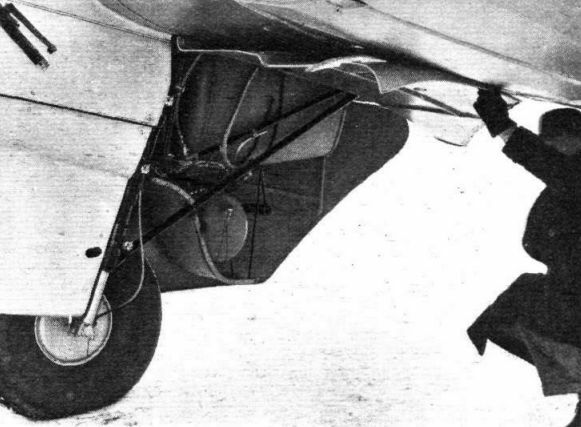 A sturdy inwardly-retracting undercarriage is not the least interesting feature. Shock absorption is obtained by means of oleo legs, rubber taxying pads and air wheels. 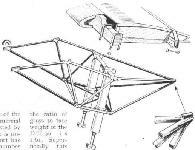 Details of the wing structure and the operating mechanism for one-half of the undercarriage. 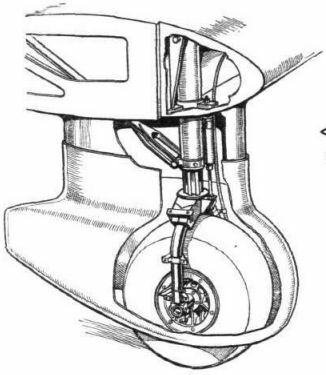 Retraction is effected either manually or electrically by a system of torque shafts and bevel gears driving a worm and gear quadrant mechanism attached to the upper end of each undercarriage strut. 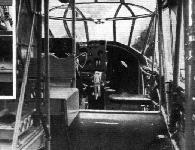 The gunner occupies the rear portion of the long cockpit enclosure. 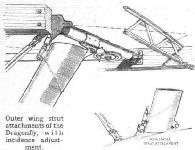 This view shows the mounting for his Browning gun. Mr. Robert Loraine at a Bournemouth meeting in 1910. D.L.H. 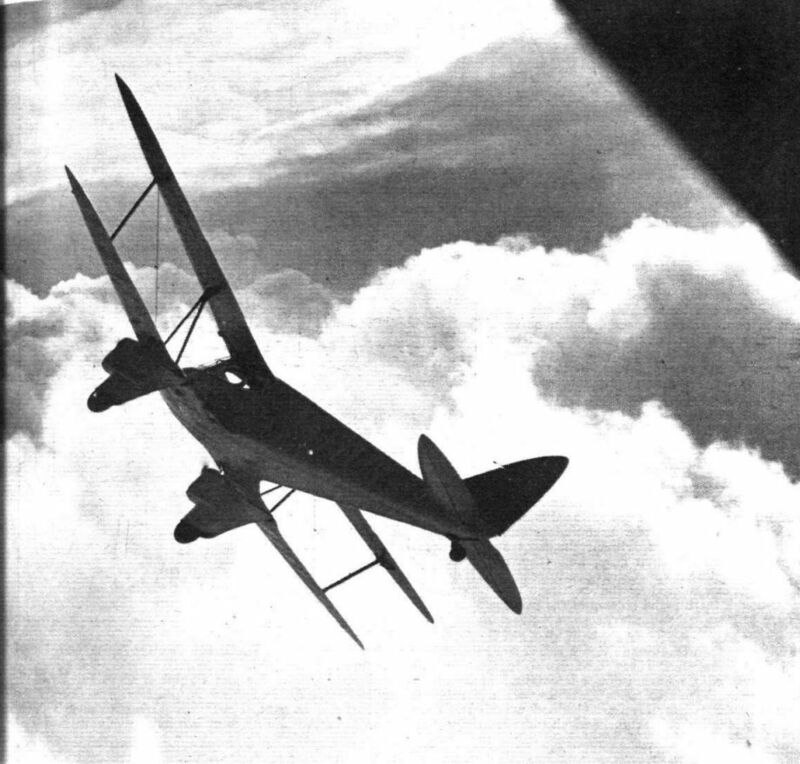 SPEED UP: The new twin-engined Heinkel, which has a top speed of 214 m.p.h. With more powerful engines, as will be fitted to a batch of the machines expected to go into service this summer, over 254 m.p.h. is hoped for, with a cruising speed of 217 m.p.h. It is fitted with flaps and a retractable undercarriage. With its present 660 h.p. 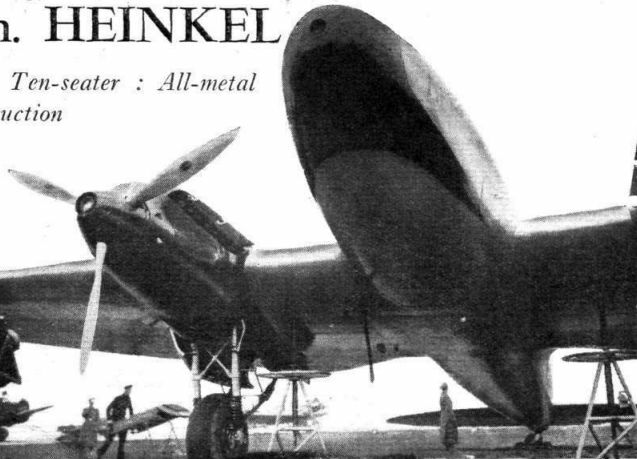 engines the new Heinkel has a top speed of 214.37 m.p.h. ; Over 254 m.p.h. is expected when the 880 h.p. units are fitted. The "non-smoking" section of the cabin. 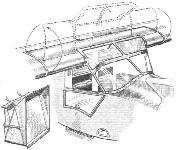 MY LADY NICOTINE will be welcomed as a passenger in the new twin-engined Heinkel; this is the smoking compartment. 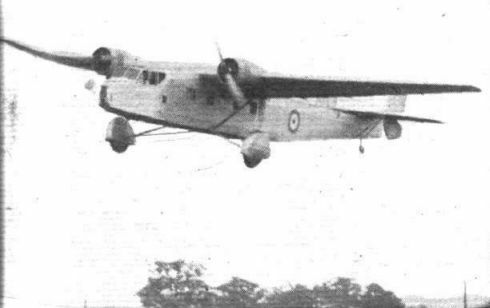 This British machine is the subject of large Air Ministry contract: the Handley Page Heyford. 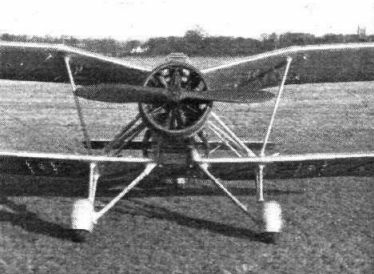 This type, as at present being built, mount the 600-h.p. Rolls-Royce Kestrel VI, which is supercharged to give that power at 11,000 ft. 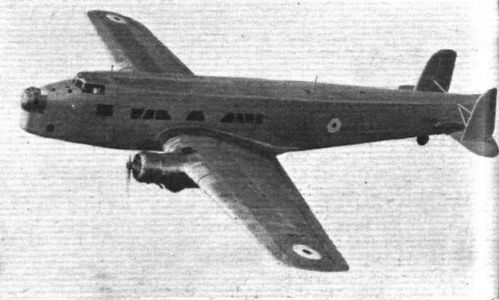 The new medium bomber Vickers Wellesley (Bristol Pegasus XVIII) is a remarkable example of the manner in which geodetic construction makes possible a high aspect ratio coupled with low structure weight. A DOUGLAS BOMBER. 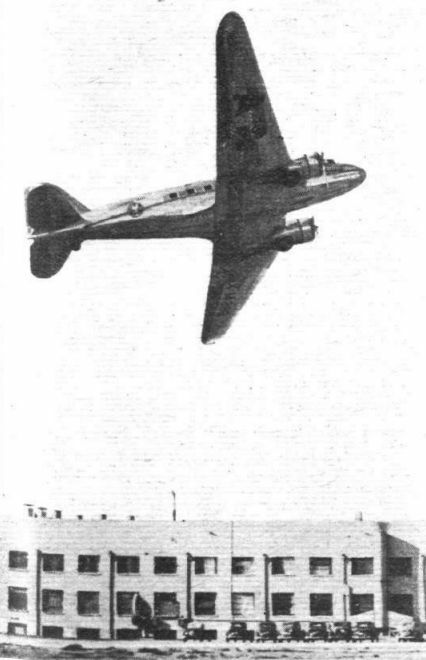 This is the high-speed, long-range Douglas entered in the U.S. Army Air Corps competition with the ill-fated Boeing 299 and the new Martin. It bears resemblance in certain features, notably the undercarriage, to the D.C.2 commercial machine. 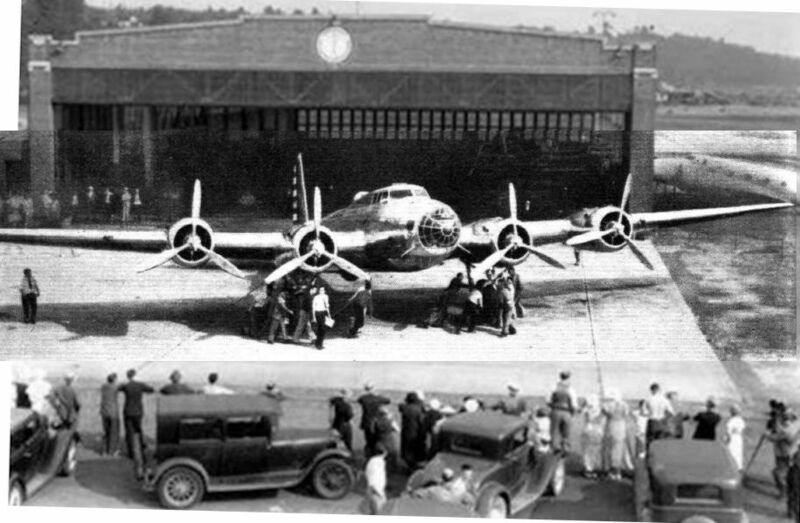 The Martin B-10 bomber has met with extraordinary success. With two Wright Cyclone engines of over 700 h.p. a speed of 215 m.p.h. is attained. 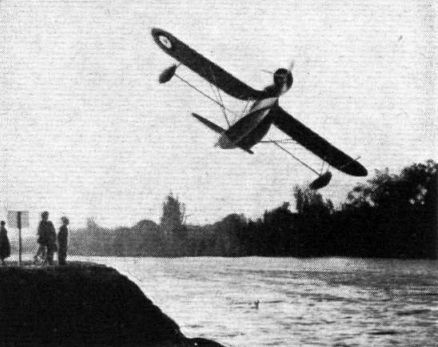 An improved type is at present the subject of Air Corps experiments. IN THE EAST: A striking picture of a flight of three Hawker machines of No. 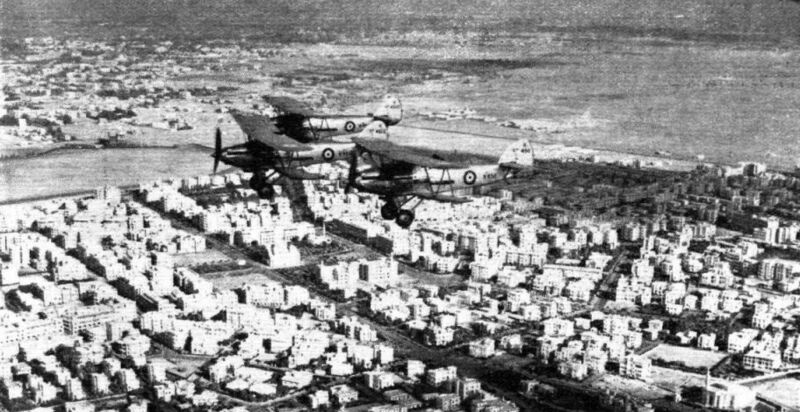 208 (Army Co-operation) Squadron flying over Cairo. This squadron is stationed at Heliopolis and is the only one of that class in the Middle East Command. It has been stated that the concentration of Italian troops and Air Force units in Libya is regarded as a possible menace to Egypt, in case Signor Mussolini should decide that some sanctions constituted a casus belli. Sir Samuel Hoare, however, made mention of British reinforcements in Egypt, Malta and Aden. The Breda 65 is a new "assault" type developed in Italy. It has a Gnome-Rhone Mistral Major engine of 800 h.p. and a maximum speed in the region of 250 m.p.h. 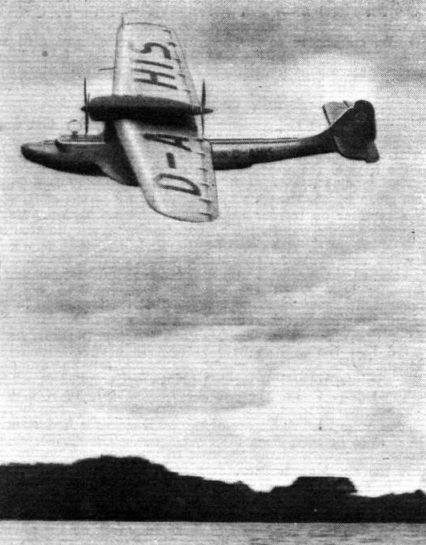 FOR SOUTHERN SERVICE: The Monsun, first of the Dornier Do. 18 boats for the German South Atlantic mail service. A range of 2,765 miles is claimed at a cruising speed of 124 m.p.h. Two 500/560 h.p. 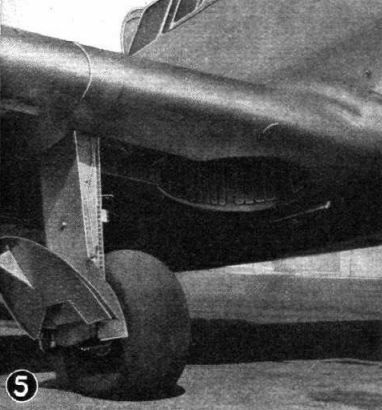 Junkers Jumo diesels are fitted, the rear one driving its propeller through shafting. A single-seater fighter flying boat: this striking snapshot shows the new Potez 453 under test. It will be interesting to see how it compares with twin-float seaplanes in carrying out the duties for which it is intended. OUTSTANDING MILITARY TYPE. The Avro Anson has been adopted as a standard coastal reconnaissance type. It does 188 m.p.h. with two 310 h.p. Cheetah IX's. 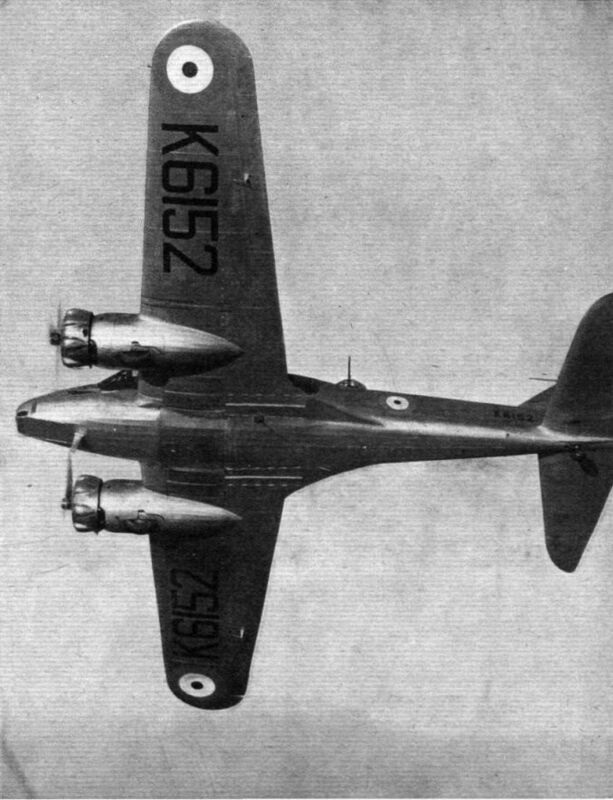 In this fine Flight photograph of the first production type Avro Anson there can be seen, among other features, the disposition of front and rear guns, the bomb traps, wing-root filleting and the interesting shape of the tailplane. 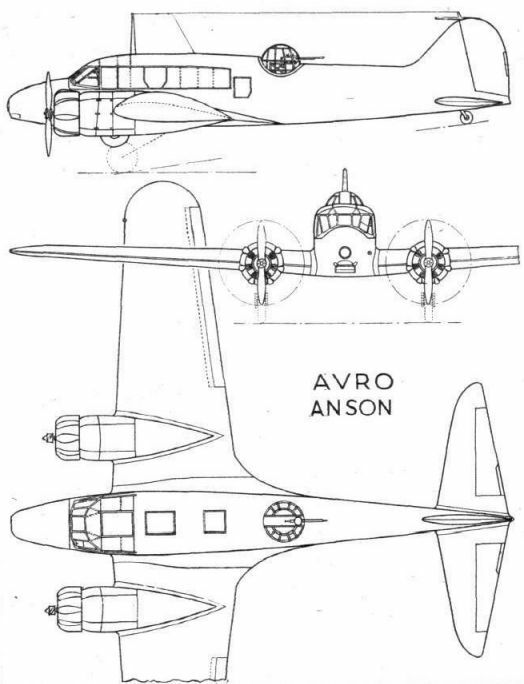 THE ADMIRABLE ANSON: Lord Anson did much in his day to improve the fighting efficiency of the Royal Navy; and the Avro Anson coastal reconnaissance machine, harbinger of hordes of monoplanes and first of its class in the Royal Air Force, will greatly assist the work of the senior Service in protecting our shores. This Flight photograph shows the first of a very large number of Ansons which will be going to Squadrons within the next few months. 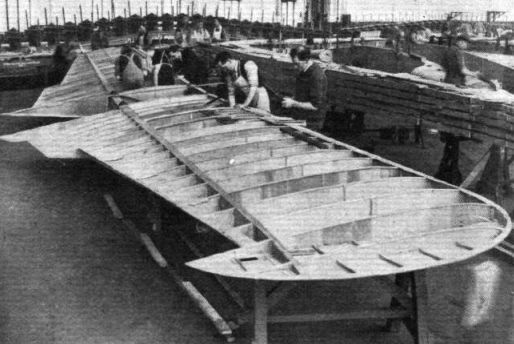 Some idea of the size and the nature of the construction of the wing may be gathered from this view. 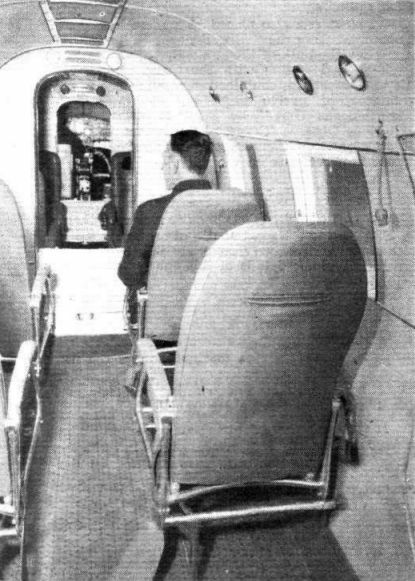 The forward portion of the cabin. 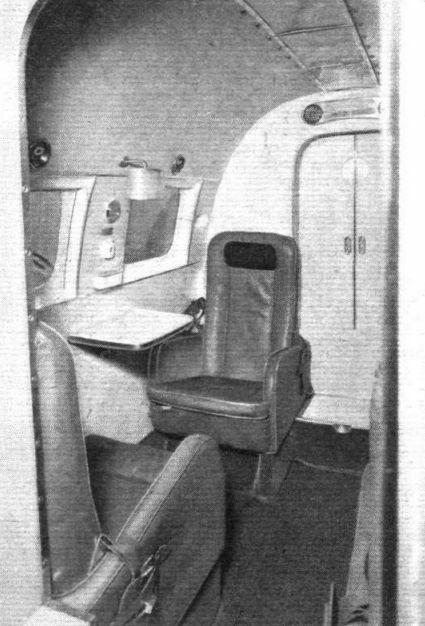 The rear portion of the roomy cabin (without its complete equipment) and the door leading into the A.W. gun turret. 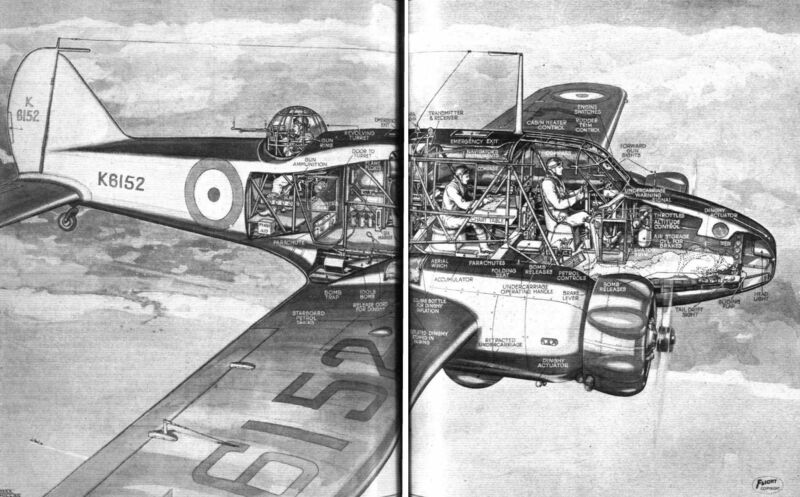 In this Flight drawing by Max A. Millar, the majority of the military equipment carried by the Avro Anson (two 310 h.p. Siddeley Cheetah) over water reconnaissance is visible. The figure shown dotted represents the navigator in his alternative position, where he acts as bomb-aimer. Note, in the nearest engine nacelle, the dinghy which is instantly inflated automatically should the machine make a forced landing on water. The complete bomb load is not shown: actually this consists of two 100-lb, bombs and four or eight twenty-pounders. 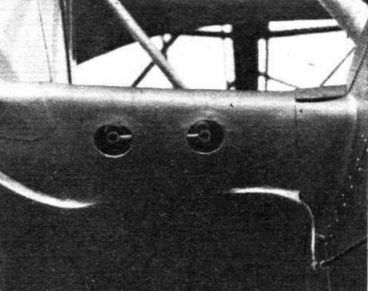 The breech of the fixed Vickers gun is just visible to the left of the pilot. FIRST OFF THE LINE: Here is the first production-type Fairey Swordfish torpedo spotter reconnaissance machine during tests at the Fairey aerodrome last week. 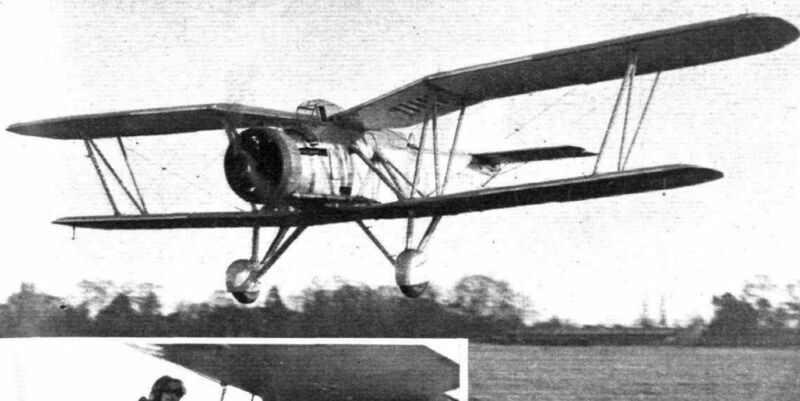 The Swordfish is fitted with the 690 h.p. 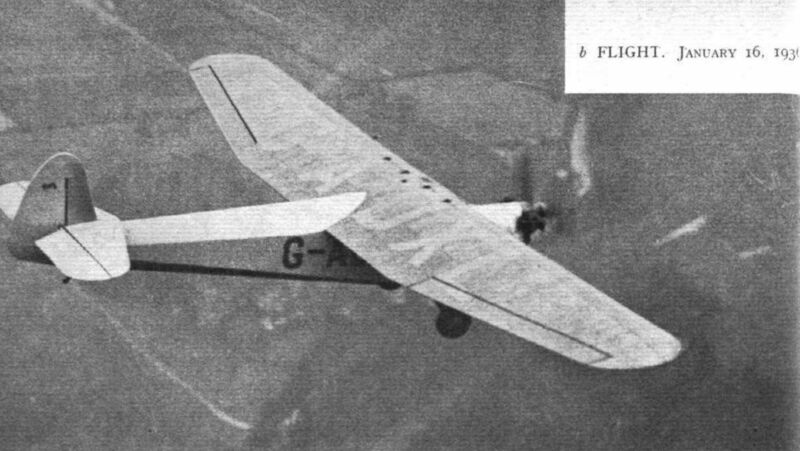 Bristol Pegasus III moderately supercharged radial: its airscrew is a three-bladed metal Fairey. 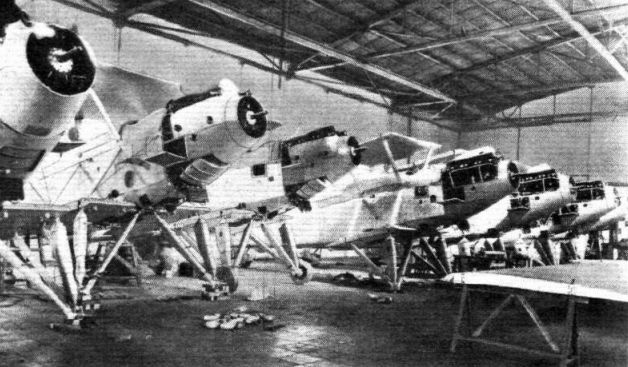 SPANISH-BUILT: Some of the Spanish Air Force Vickers Vildebeest torpedo-bombers under construction at the Getafe, Madrid, works of Construcciones Aeronauticas S.A., who are building them under licence from Vickers (Aviation) Ltd. Twenty-six have recently been completed, with wheel undercarriages, while conversion sets to enable the machines to be used as twin-float seaplanes have also been produced by the C.A.S.A. Hispano Suiza engines are fitted. It is stated that the naval authorities, in particular, are extremely pleased with the Vildebeests. PANORAMA OF THE PYRAMIDS. 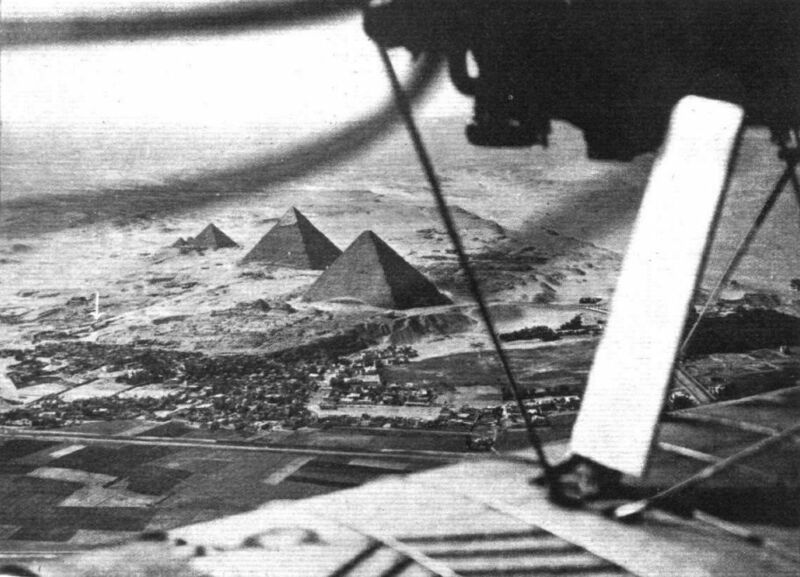 Many aerial photographs of the Pyramids have been taken and published, but there is novelty in the extensive view shown in this picture, taken from one of the bomber-transport machines of No. 216 (B.T.) 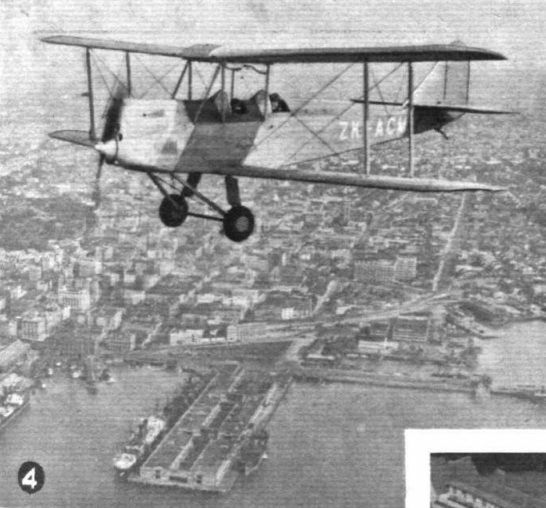 Squadron, which is stationed at Heliopolis. The whole array of Pyramids is seen, while the arrow points out the location of the Sphinx. The recent excavations round the base of that mysterious monument can be discerned. The considerable town in the neighbourhood is also interesting. OUTSTANDING CIVIL TYPE: The De Havilland Hornet Moth (130 h.p Gipsy Major) side-by-side two-seater. Mr. J. C. C. Taylor, one of the aviation representatives of Shell-Mex and B.P. 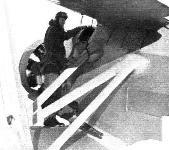 Ltd. in the cabin of the new Hornet Moth of which the company has recently taken delivery. 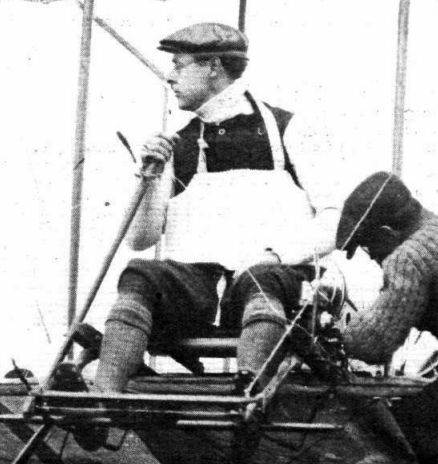 "Throwing it About": Mr. H. Buckingham gives the D.H.90 a thorough try-out above the clouds. Ample room everywhere and a noise level reduced to the neighbourhood of 70 decibels are features of the D.H.90 cabin. 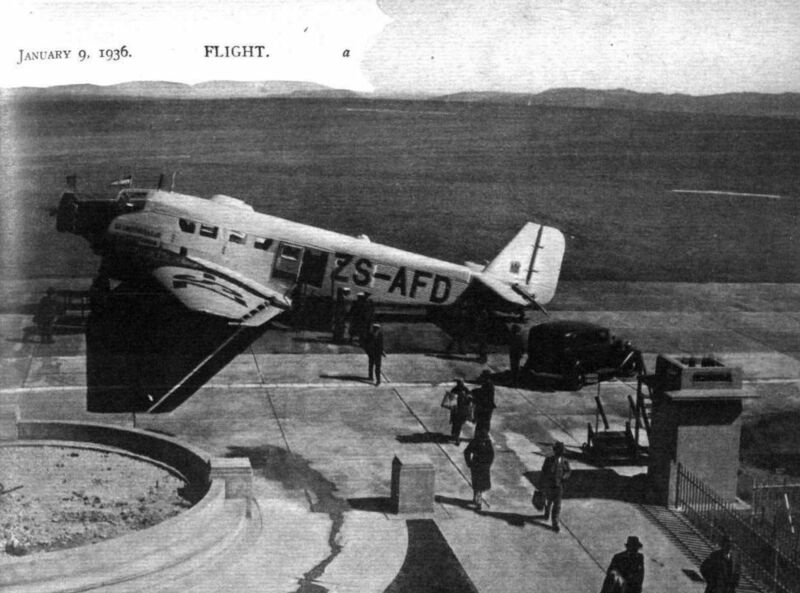 The accommodation provides for pilot and four passengers, one seated next to the pilot. Note the dual flying controls. 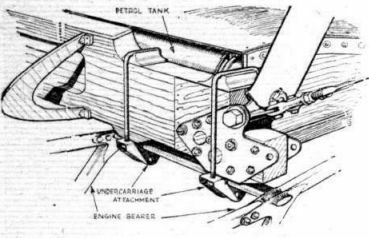 An extra petrol tank of 25 gallons capacity is installed under the rear seat. 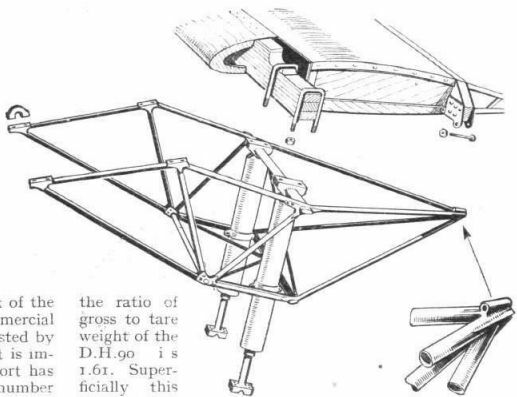 The D.H.90 Dragonfly shown partly "in skeleton." 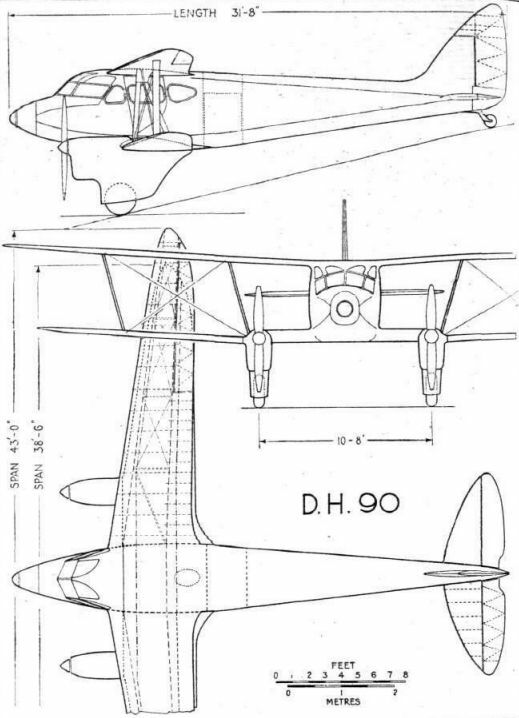 The lower wing roots of the D.H.90 are of thick section, and in addition to carrying the wing bracing as cantilever beams they contain the two main petrol tanks, each of 30 gallons capacity, and also carry the engine mountings and undercarriage structure. 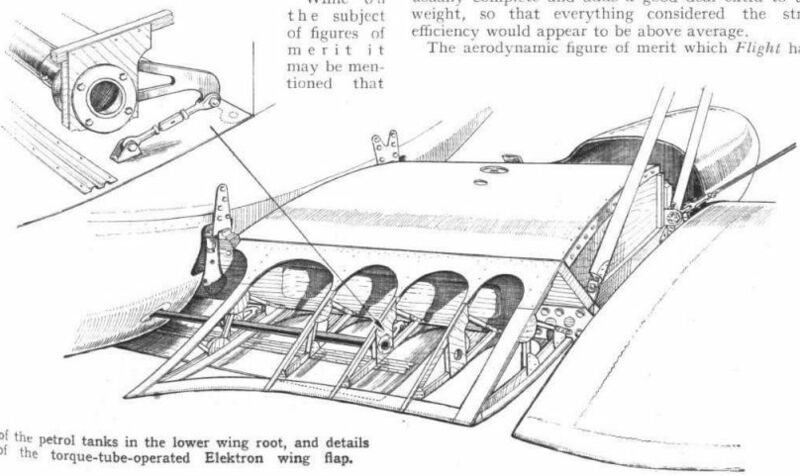 Details of lower wing root, engine mounting and undercarriage attachment. 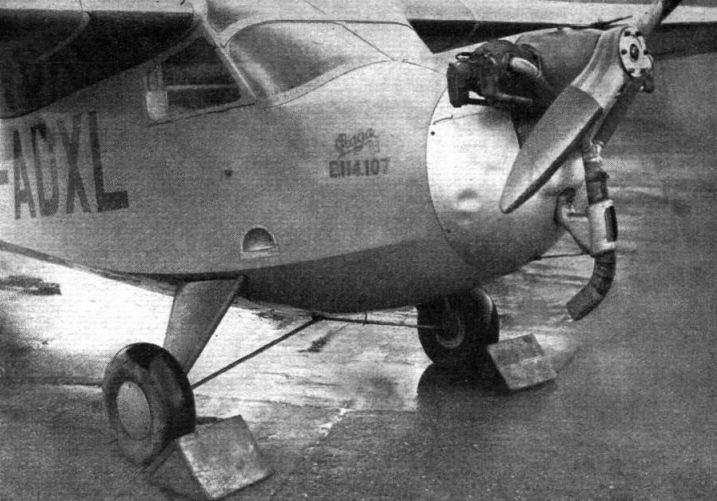 One of the petrol tanks in the lower wing root, and details the torque-tube-operated Elektron wing flap. Outer wing strut attachments of the Dragonfly, with incidence adjustment. 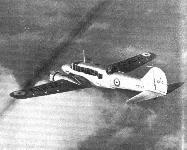 This British machine is the subject of large Air Ministry contract: the Fairey Hendon. 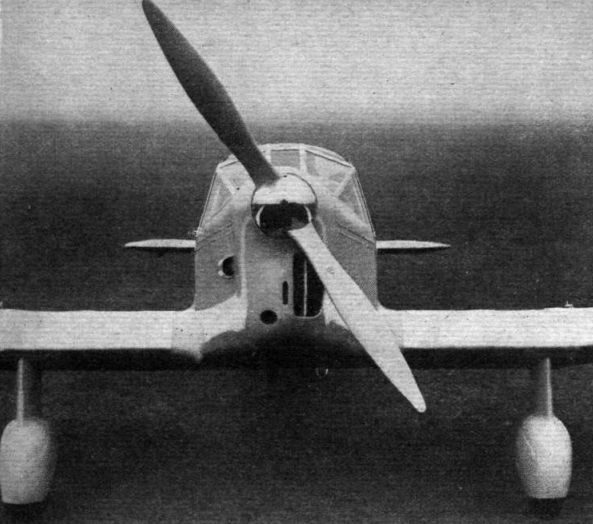 This type, as at present being built, mount the 600-h.p. Rolls-Royce Kestrel VI, which is supercharged to give that power at 11,000 ft. The cabin of the Vega Gull is 44 in. wide and permits side-by-side seating without cramping. Despite the fact that the Vega Gull has the same power plant as last year's three-seater Gull it carries its four passengers at 170 m.p.h. Capt. Percival, in fact, says that the maximum speed is a shade over this figure. Say "Ah!" Capt. 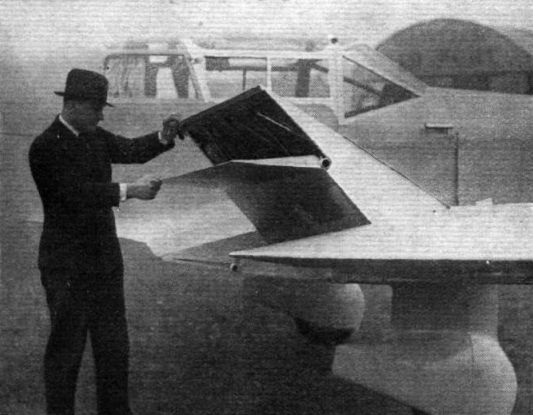 E. W. Percival, designer of the Vega Gull, inspects the flaps (which are of greater area than those of the Gull) on the machine he demonstrated at Gravesend. An improved wing-folding arrangement has been introduced on the Vega Gull. It embodies a tommy bar (which disappears inside the wing) in place of the old fixed handle. General arrangement of the Vega Gull. The clean and handsome lines of the Praga are effectively shown in this photograph. 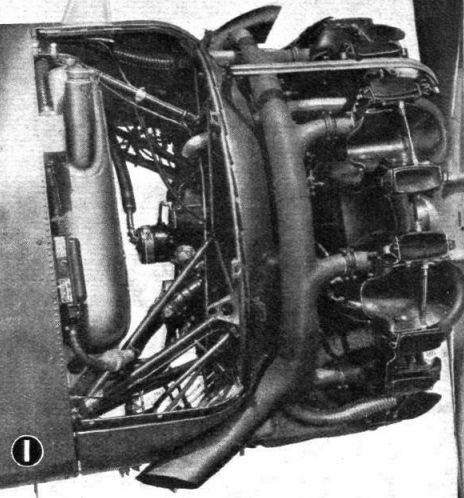 The business end of the Hillson Praga, showing the engine and its exhaust system (with heater muff) and the divided undercarriage. 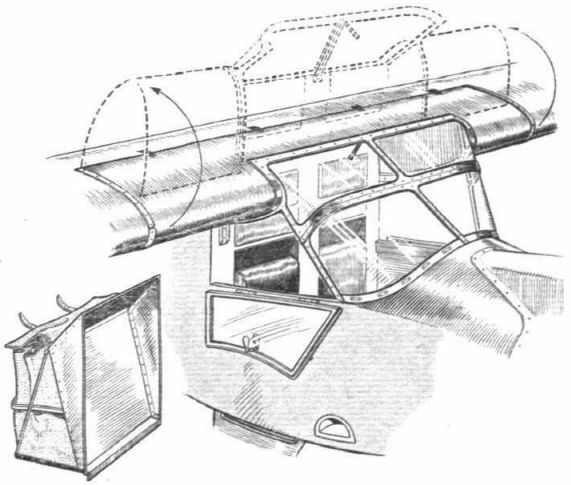 How the leading edge and part of the windscreen are folded back for entry into the cockpit. To the left is shown one of the fitted haversacks for light luggage. These lie behind the seat-backs, which are designed to accommodate either cushions or back-type parachute packs. THE TRANSATLANTIC LOIRE. This Flight sketch gives some idea of the appearance of the Loire 102 flying boat being built for the French South Atlantic service. It should be flying by April and is being fitted with four Hispano series X twelve-cylinder water-cooled engines of approximately 700 h.p. each. The cruising speed should be close to 165 m.p.h. with four passengers, 1,430 lb. of mail and fuel for a range of 2,640 miles. CONTINENTAL: This is the one of most recent French efforts at building thirty-passenger transports. It was designed to meet the requirements of Air France. The Bloch 300 or "Pacifique" has three Gnome-Rhone Mistral Majors, moderately supercharged to give 880 h.p. at 6,500 feet. Maximum speed is estimated to be in the neighbourhood of 220 m.p.h. 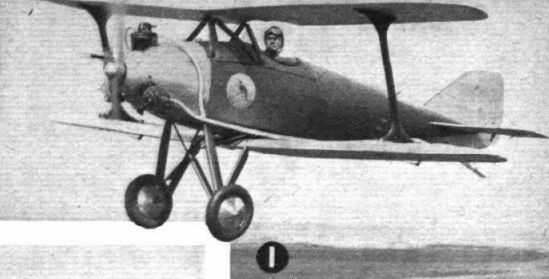 The Caudron Simoun. This is the machine which visited Lympne this summer, and is similar to that used on the Paris-Madagascar flight. 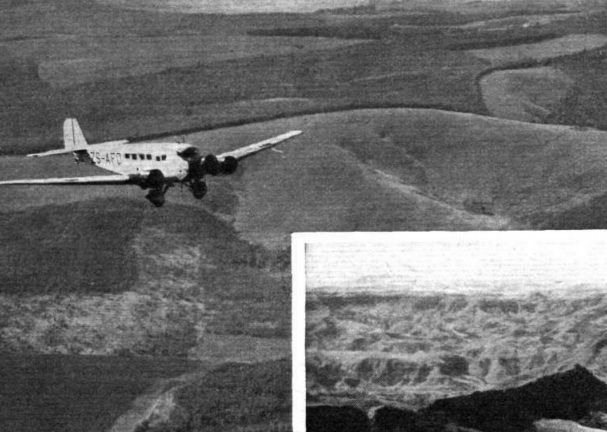 OVER ETHIOPIA: Apart from the unpleasant fate which is alleged to await Italian pilots who make forced landings in Abyssinian territory, the terrain suggests that the forced landing itself may be sanguinary enough. 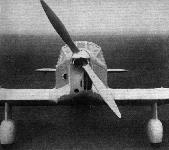 The machine - one of the "Disparata" squadron - is a Caproni 101. The latest U.S. Navy fighter to go into service is the Grumman F2F-1 shown here. It is powered with a 650 h.p. Pratt and Whitney Twin Wasp Junior. OUTSTANDING CIVIL TYPE: One of four machines which made their first appearance during 1935: (4) the Miles Merlin five-seater with Gipsy Six. COMDR. 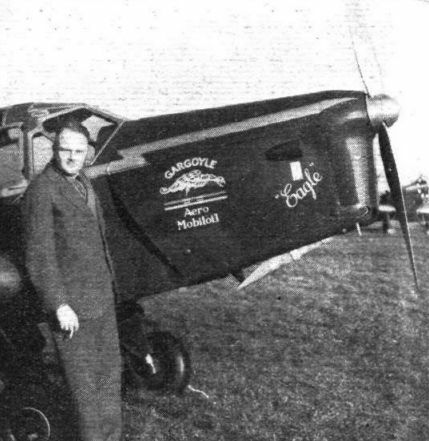 H. T. WHITE, aviation manager of the Vacuum Oil Co., with the new B.A. Eagle which the company has purchased. The equipment includes sound-proofing by Rumbolds. 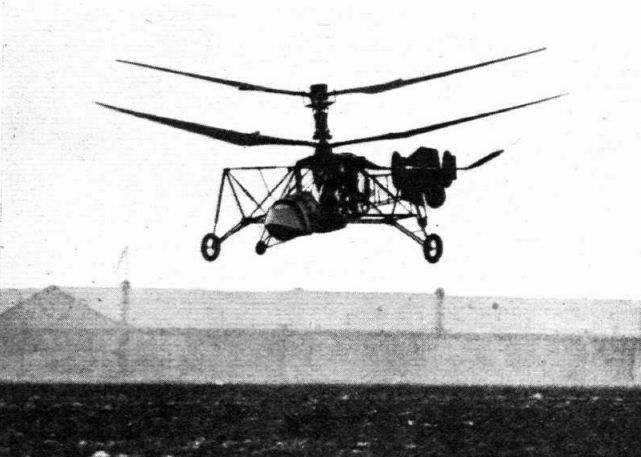 There is no doubt, in this photograph, about the Breguet gyroplane being completely air-borne and as they used to say in the old days, "in full flight." A speed of 62 m.p.h. has been attained. HOME FROM THE STRAFE. Eighteen Curtiss A-12 attack monoplanes (700 h.p. Cyclone F) of the United States Army, land simultaneously at the eighth annual all-American air manoeuvres at Miami, Florida. 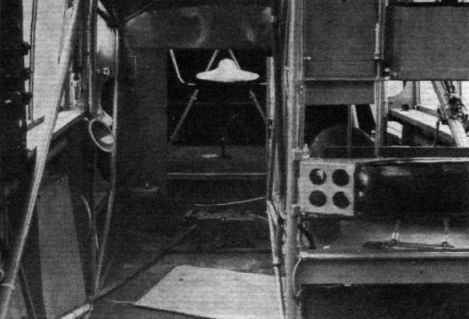 The bulbous object beneath the fuselage of each machine may be either a long-range tank or a bomb. THREE DAYS TO CHILE. Air France inaugurated its South Atlantic mail service last Saturday. 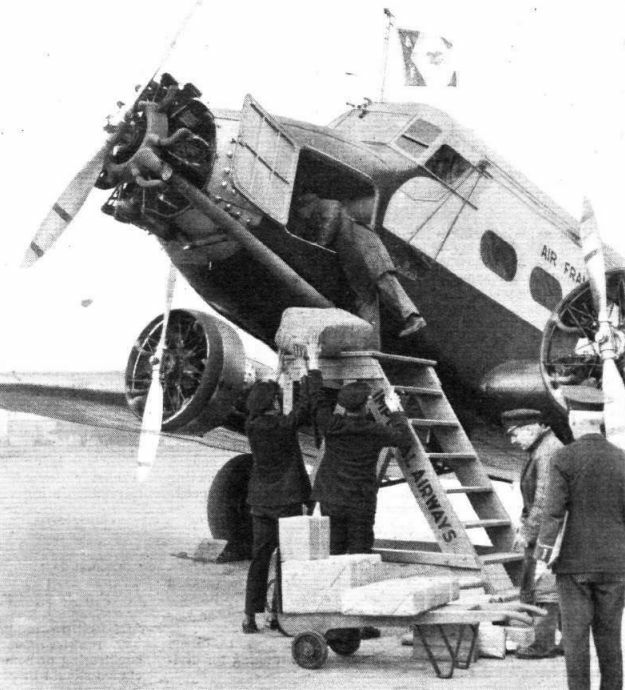 On the picture is a scene at Croydon on Saturday, with the mail being loaded into a Wibault-Penhoet for the first stage. The Auckland Aero Club's Avian (Hermes II) flying over Auckland. 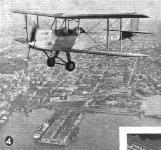 Faith in Australia, the veteran Avro Ten of Tasman Sea fame, over Auckland. 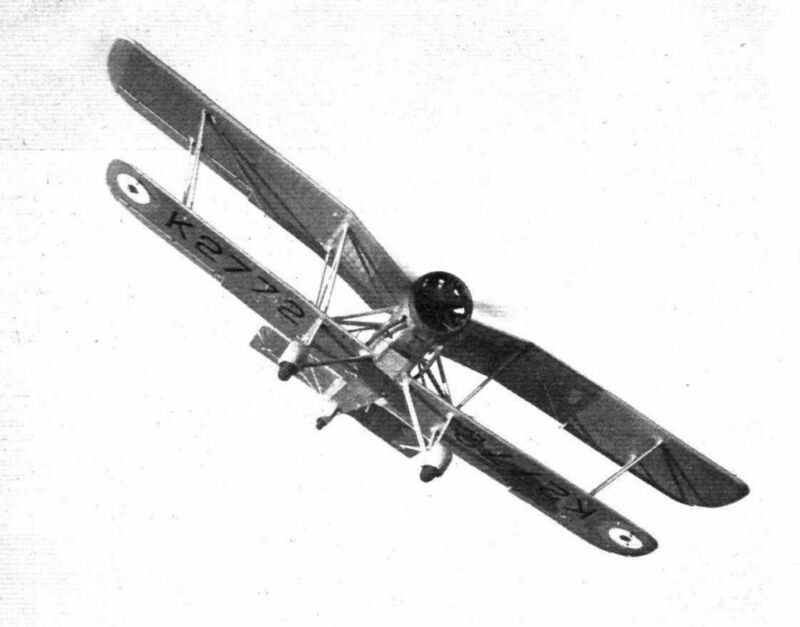 A pioneer type in the development of the modern long-range high-speed bombing monoplane, this Boeing, built five or six years ago, was capable of 180 m.p.h. The prototype Consolidated P-30 two-seater pursuit with Curtiss Conqueror engine. The type has been adopted by the U.S. Army Air Corps. 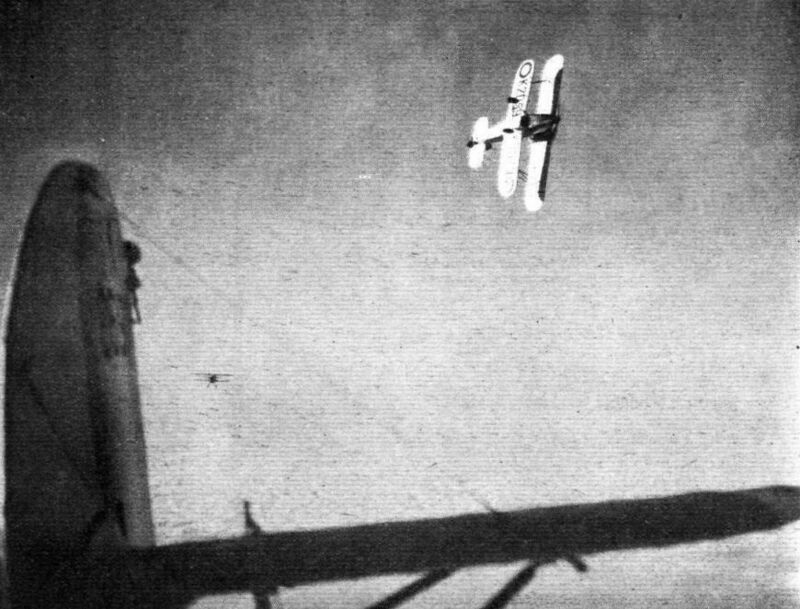 The Dornier Do.Y bomber did 155 m.p.h. with three Jupiters of an old type. A.G.E.C floodlight, mounted as a mobile unit, in use at the Brighton, Hove and Worthing municipal airport. 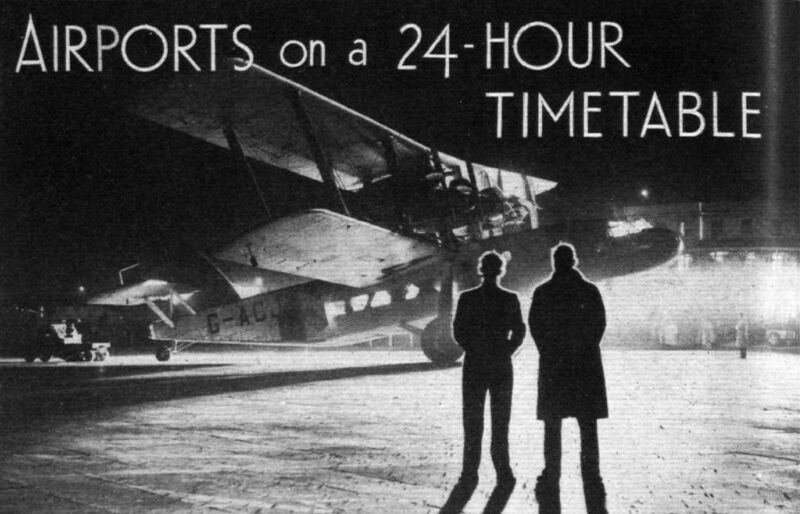 The experimental Boeing 299 (four Pratt and Whitney Hornets), which, entered in competition with a new Martin and Douglas, was destroyed in a crash - through no fault of its own - some weeks back. It is said that the crash was caused through the pilots taking off with locked controls. According to one report the 299 has been adopted by the U.S. Army Air Corps. OUTSTANDING 1935 MILITARY TYPE. The A.W. 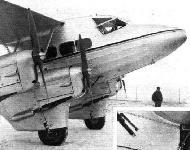 XXIII is a new bomber transport with two 760 h.p. 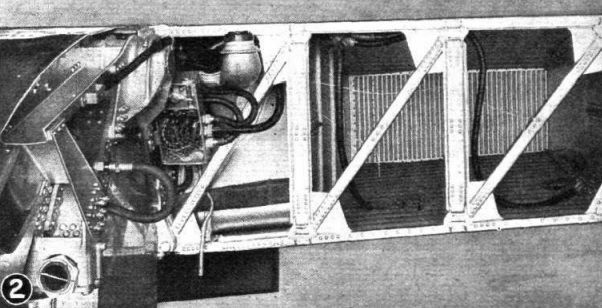 Tiger VI engines. 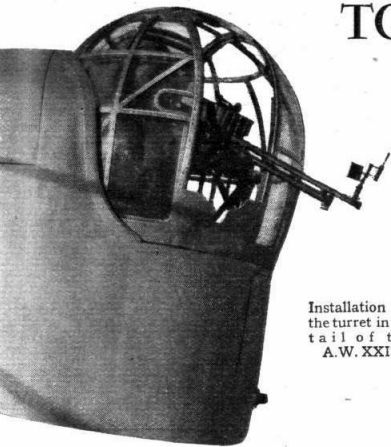 Installation of the turret in the tail of the A.W. XXIII. 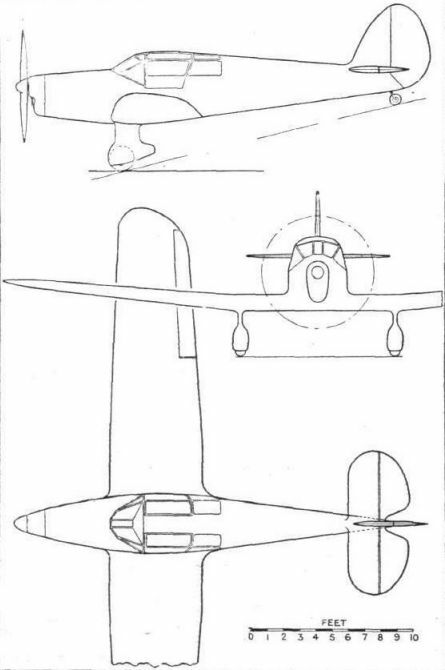 These diagrams show the method of operation of the A.W. turret. The gunner stands to fire downwards. OUTSTANDING MILITARY TYPE. The H.P. 51 bomber transport (two 760 h.p. Tiger VI) has slotted flaps which give it a wide speed range. 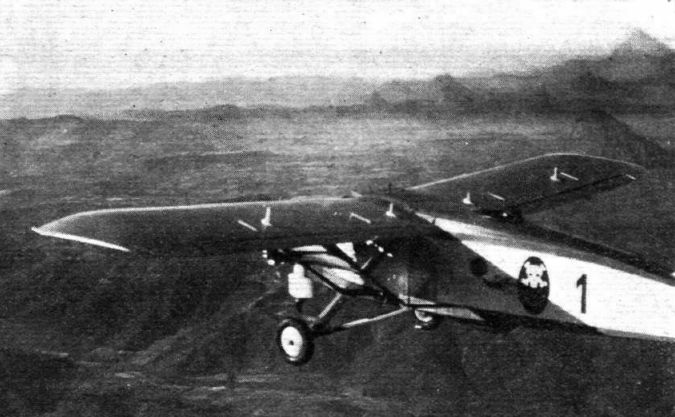 FOUR-MOTOR NIGHT BOMBER. 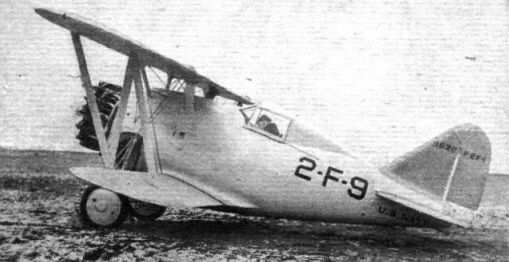 Photographed in 1933, immediately after final erection, but before service roundels applied, is this "one-off" French prototype, the Potez Type 41 Bn4, which was succeeded by the later Potez Type 54. 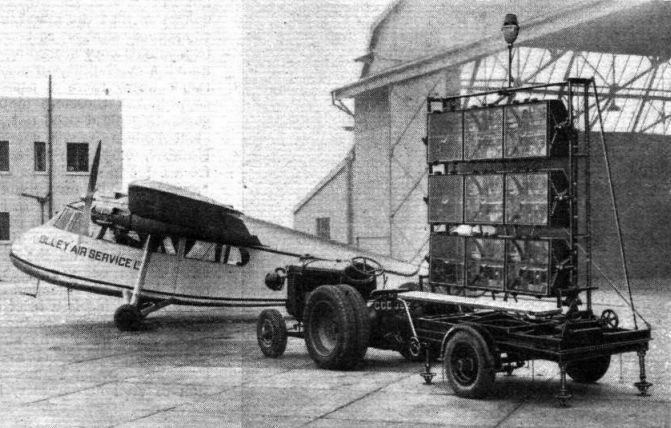 The two pairs of pylon-mounted Hispano-Suiza 12 Ybrs engines delivered a total of 3,360 h.p., giving a max. speed of 199 m.p.h. for a.u.w. of 37,480 lb. at 13,120 ft. Its undercarriage was retractable. PRACTICAL PROOF: On December 20 Mr. Robert Kronfeld delivered a B.A.C. Super Drone to Holland and flew well over 200 miles non-stop in the process. He left Hanworth at 10.30, cleared Customs at Croydon and landed eventually at Zierikzee, some twenty miles from Rotterdam. The weather was foggy and cold, but, with the new exhaust-warmed induction system, no trouble was experienced. In this photograph the Super Drone is being demonstrated by Mr. Kronfeld at Schiphol, Amsterdam. The S.P.C.A. 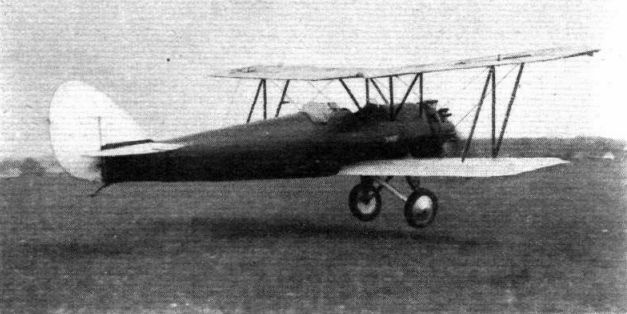 30 M.4 (two 650 h.p. Lorraines). It is considerably older than the other machines but is interesting because its tail is carried on two booms. Bristol airport is an example of club and municipal co-operation. 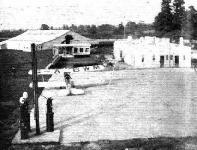 This snap shows the clubhouse, passenger station (in course of erection) and Airwork service hangar. 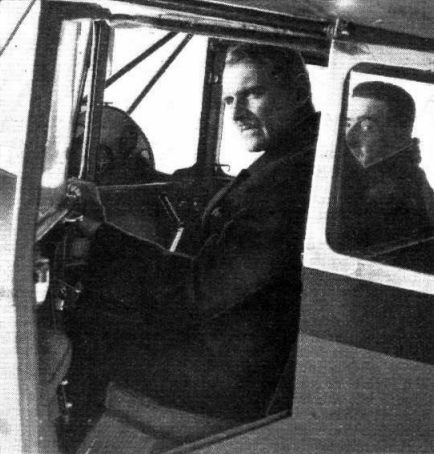 THE FIRST OF A SERIES: On his first flight with his new Cambridge sailplane, the Duke of Grafton (right) obtained his "C" certificate. This machine, designed and built by Zander and Weyl, is the first of a small series and has already proved itself with soaring flights of more than an hour's duration. Certain particulars of the little Rasmussen IIa racer are given on this page. It does 142 m.p.h. on 40 h.p. and will eventually do better than that. 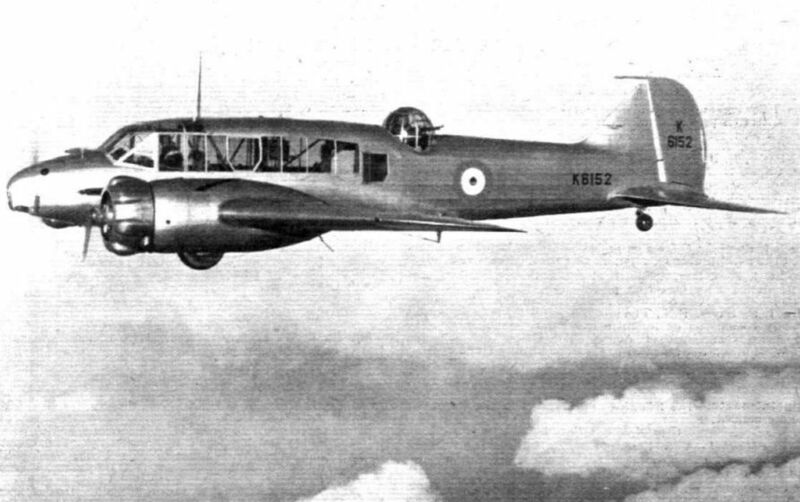 Home-built at Auckland: The Tui (45 h.p. 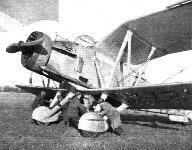 Szekely S.R.3); constructor, Mr. Fred North; tested by Mr. Allan McGruer; flown for photograph by F/O. 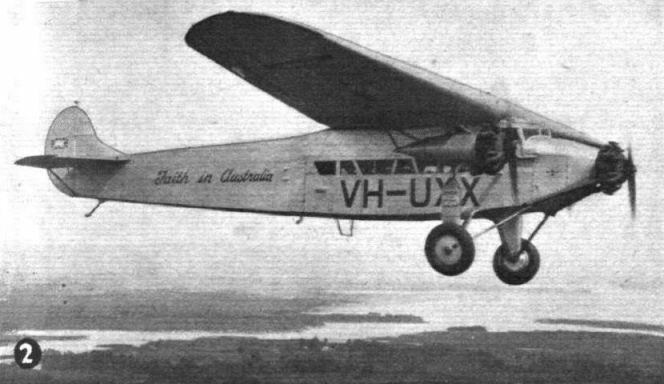 R. A. Kirkup, of East Coast Airways; top speed, 90 m.p.h. 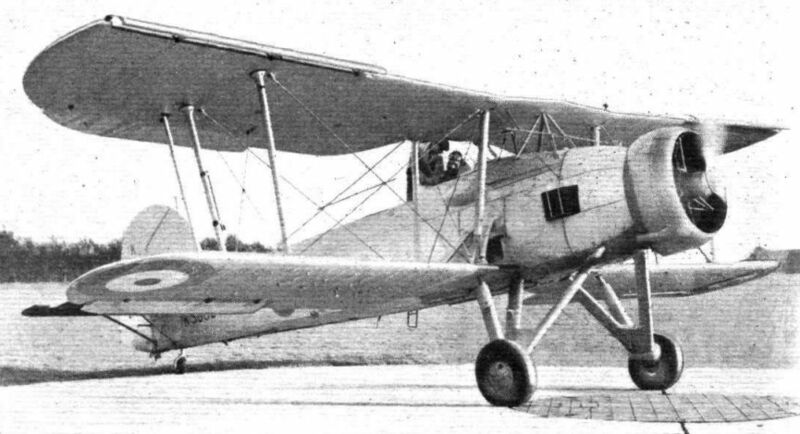 FOR GENERAL PURPOSES: Built to the Air Ministry specification G.4/31, this Pegasus-engined Parnall Biplane is in the General Purpose class and can be used for precision and dive bombing, torpedo dropping, etc. It embodies numerous unorthodox features. Propulsive effort by members of the ground staff. 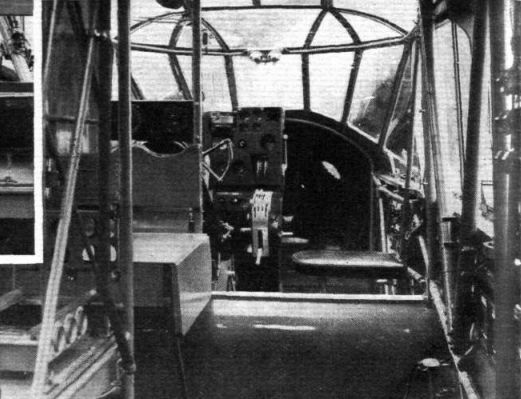 Note in this picture the pilot's enclosed cockpit.